"You've seen the movie . . . wait 'till you hear it"
When National Public Radios thirteen-part adaptation of Star Wars was first broadcast in 1981, it generated the largest response in the networks history: 50,000 letters and phone calls in a single week, 750,000 listeners per episode, and a subsequent forty percent jump in the overall NPR audience. 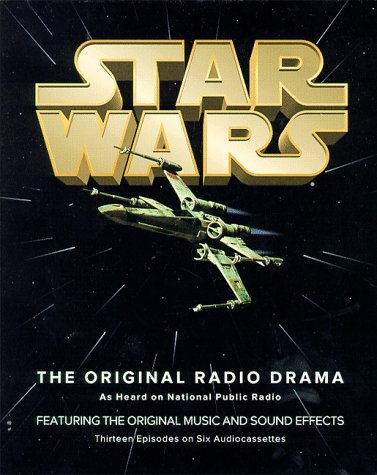 This landmark production began when Star Wars creator George Lucas donated the story rights to the NPR affiliate station at his alma mater, the University of Southern California. Then came the enormous challenge of translating the intensely visual adventure to a purely aural medium. Noted science-fiction writer Brian Daley adapted the movie script to the special demands and unique possibilities of radio, producing an enhanced version of the story, with many episodes not seen in the film and a much greater emphasis on character development. Listeners to the radio drama learn details of Luke Skywalker's youth on the planet Tatooine and follow the story of Princess Leia before she leaves on the mission that opens the film. Director John Madden, a veteran of numerous BBC radio dramas, guided the cast through a demanding ten-day dialogue recording session. Then the project was entrusted to virtuoso sound engineer Tom Voegeli. Using the original master tapes of the movies Oscar-winning music and sound effects, he spent months mixing the final stereo version of Star Wars: The Original Radio Drama . The result is a Star Wars that is familiar, yet completely new  an exhilarating fable for the minds eye. Heading the cast of this audio version are Mark Hamill and Anthony Daniels, reprising their film roles as Luke Skywalker and robot See Threepio. Other cast members include Bernard Behrens as Ben Kenobi, Perry King as Han Solo, Brock Peters as Darth Vader, and Ann Sachs as Princess Leia. "People have said to me, How can you do Star Wars on radio, having all of those effects?" actor Anthony Daniels commented during production. "In fact, they miss the point that itll be, in a way, better to do it on radio. Sound effects are rather like smells  theyre very evocative. You can sit at home and have the whole galaxy whizzing around your head." Director John Madden summed up the excitement generated by this ambitious undertaking when he said, "A phrase has come to mind in working on this project: You may think youve seen the movie. Wait til you hear it."